The National Museum is a wonderful place to visit in Rome. There is much to explore! 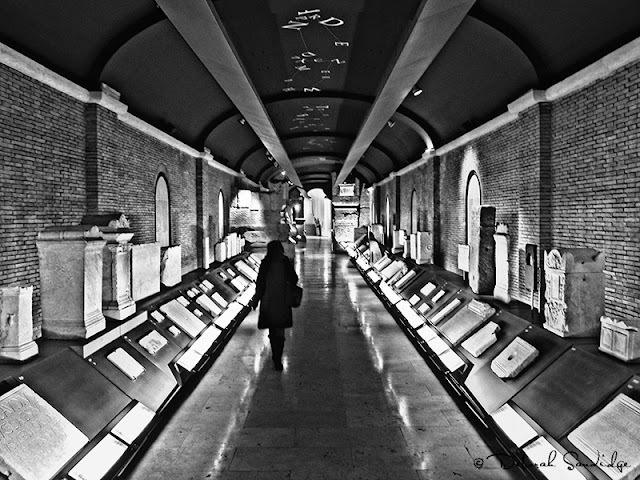 I liked the woman admiring the artifacts, and it seemed the perfect opportunity to create a black and white interpretation. Black and white imagery has a timeless appeal, and classic traditional look. Converting to B&W can create a more dramatic and expressive image, without the connotations of color. This allows the viewer to take in the wonderful texture, pattern, shape, light, shadow and tonality throughout the image.